I normally wait until I have got a web page more or less complete before putting it on the site, but the Bédar mines are so large both in area and in time span that I have decided to enter it piecemeal and will update it as and when I can. The mines of Bédar (and elsewhere) are old. In many cases they were abandoned fifty or more years ago and are just as the miners left them when they last walked out. Rock falls, cave-ins and land slips abound. Do not go into them without a guide who knows what he or she is doing. Similarly, railway tracks often took precipitous routes around mountains that have now worn away to narrow ledges. Always try and have someone with you, if you are on your own, don't go into potentially hazardous situations. The mines are not suitable for children. 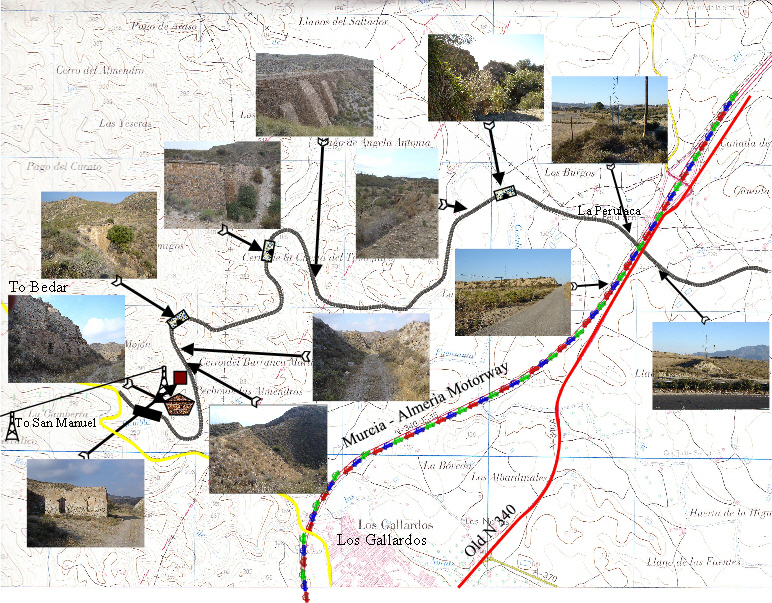 Apart from the area near to the Bédar road and the loading bay at Garrucha (see "Exploring the central part", below), access to the remoter ruins is by unsurfaced mountain tracks. Although some of these are OK for small cars, many are not and an off-road vehicle is recommended. Remember that many hire cars are not covered by insurance away from tarmac. Rain can, and does, cause havoc to these tracks. Phil showed me routes that he had taken in the past that were now impassable, even in a Jeep. If it has just been, or is, or is about to, rain, do not go. However, there is much to see and with a bit of commonsense you can have many enjoyable trips out. A lot can be seen from GE. The end of the railway at Tres Amigos, together with the funnel-shaped hopper and the Catalina hopper show up clearly. Most of the trackway to Garrucha can be followed as can that to Catalina. South of Garrucha the loading bay shows up clearly. Also at present, until they update it, the now destroyed station buildings show up. I plan to get permission from Google to use these. This page contains many sketch maps and pictures. I have placed some of the maps separately and given links to them. Mining in and around Bédar has gone on for hundreds of years and even if one considers only "modern" iron ore extraction, this covered a period of around a hundred and fifty years. The maps below show the locations that I have been able to piece together so far. Please note that (a) I have not yet been able to visit the very remote locations and (b) a lot has now been completely destroyed, especially by development around the village of Serena. The first map All the mines is a sketch that I have drawn on to local maps. The black lines represent railways. The track beds for most of these still exist, particularly the main line that went to Garrucha. The black lines with little circles hanging from them indicate aerial cables. Virtually no traces of them exist (the support posts shown are merely representational). The hatching shows inclined planes, many of which can still be identified. The little buckets mean hoppers and the names are those of mines. Click on the picture to enlarge it and use the back arrow to return to this page. The second map The central part is a more detailed look at the central area. This is easy to view as it is next to the main road and there is ample parking. The arrows point to the major sites of interest. Be very careful when exploring, particularly around the funnel-shaped hopper (FSH) as there is little protection from a serious fall. The first thing you see is the ruins of a station building. Behind that, to the right is a cutting and the remains of the station platform. Behind the platform was the terminus of the aerial cable that went to Cuatro Amigos (Four Friends). If you push your way through the undergrowth to the left along the railway track for about 50m you come to a short tunnel which led to the bottom of the FSH. 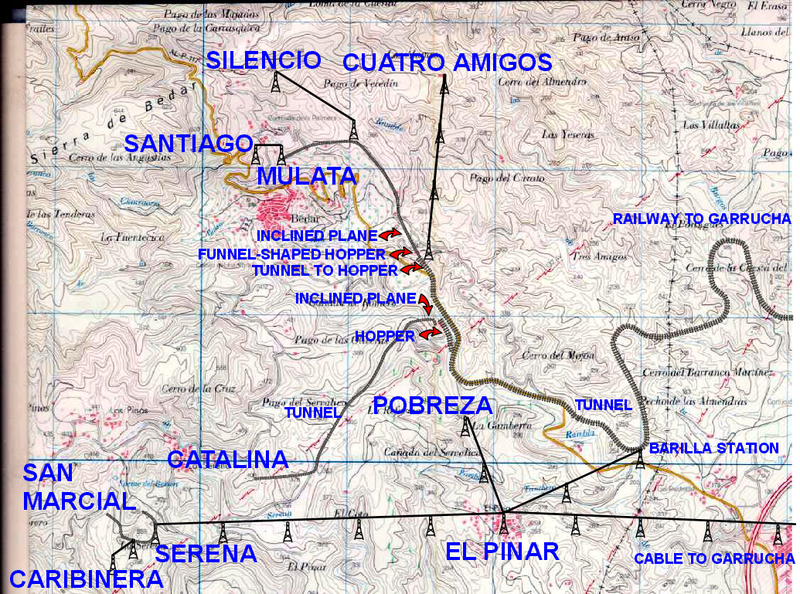 Wagons were pushed along the tunnel and loaded via a chute from the FSH, which received ore from the Mulata, Santiago and Silencio mines. The tunnel is accessible but is in a poor state, so you enter at your own risk. Retracing your steps, walk up the steep track to your left and you will be able to peer down into the FSH. It is fenced off for a good reason - it is very deep. Behind the hopper you can clearly see the line of the inclined plane that fed the hopper. If you follow the track to the top and turn left you arrive at the top of the plane. I have not explored beyond this point yet and will write more here when I do. The picture above shows the Garrucha railway station terminus area. Returning to the station, drive down towards Los Gallardos for a short distance. You cannot miss the next thing to see, on the right is the huge hopper of the Catalina mine. A short track which was the branch line of the main railway leads off over a bridge. There is easy parking here. The hopper can easily explored and if cattle are not being kept there, you can get inside. Some scrambling will take you to the top, where you can see the lines of the inclined plane which fed the hopper. Back at the hopper, a track leads on to a large house. This was the Catalina mines manager's house, now completely renovated. The picture above shows a view of the Santa Catalina hopper and inclined plane. The numbers indicate points of interest. The picture above shows the view from the top of the Santa Catalina inclined plane. The numbers indicate points of interest. Whether you explore the next bit or not depends on your car! If it is large and expensive - don't go! A track leads off up the hill from where you parked your car for the hopper. At the top it then follows the line of the railway that led to the Catalina mine. After a short while, the line goes through a tunnel - just wide enough for a small car. If you stop halfway through the tunnel, on the right is a chute where ore was loaded into wagons from the Alerta Mine (see main diagram). Continuing, you reach a building on the right which was the shed for the Catalina Railway engine. Here through dense scrub, is an entrance to the mine. DO NOT GO IN WITHOUT A GUIDE. I went in with one and even he got lost for a while. 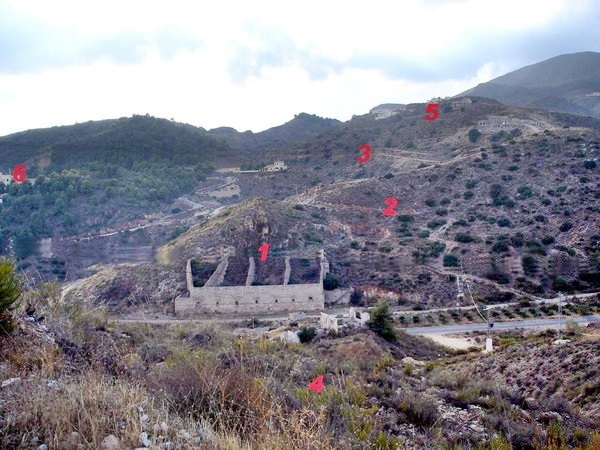 In 2007 I went into this mine in the company of Juan Antonio Soler Jódar. It was a fascinating and somewhat scary experience. It was also filthy. Nothing had been touched since the mine closed decades before. Old boots, bits of sacking and the remains of sleepers (pictured, left) were still scattered about.For more information on the mine see Juan's web site - link above. The route for this is shown on the two introductory diagrams. It ran from the inclined plane above the Santa Catalina Hopper (see picture above) to the Santa Catalina Mine. On its way it went through a 90m Tunnel. Inside the tunnel can still be seen the chute that was used to load ore directly into wagons from the Alerta mine above. It is in a poor state. 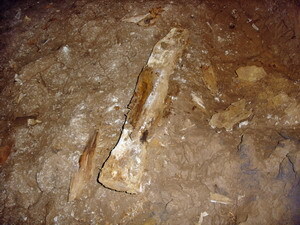 The two pictures on the left show the remains of the hopper and the tunnel itself. The mines of Coto Serena, a little way to the south of Serena Village were the most densely packed of those in the Bédar area. In an area of about 10 km2 there were about 10 major mines and many smaller ones. Many of these were located along the banks of the Barranco de los Lobos (Valley of the Wolves). This has a stream (after heavy rain) that is a tributary of the Rio Jauto. This in turn flows into the Rio Águas, entering the sea north of Mojacar. This rather lengthy description should help locate Coto Serena. 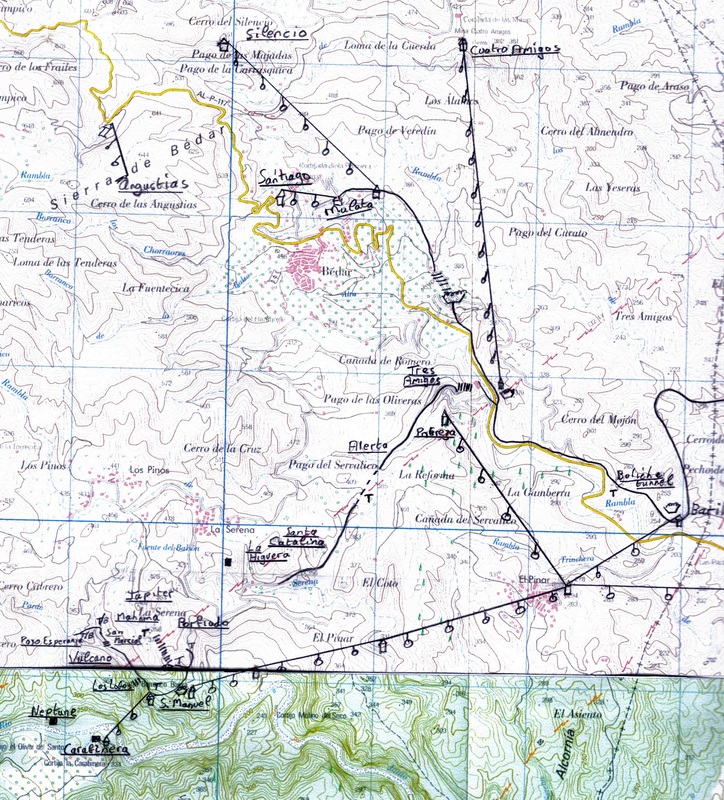 On the subject of locations, a very good set of maps is the Mapa Topográfico Nacional de España. The three needed are Turre, Vera and Garrucha. 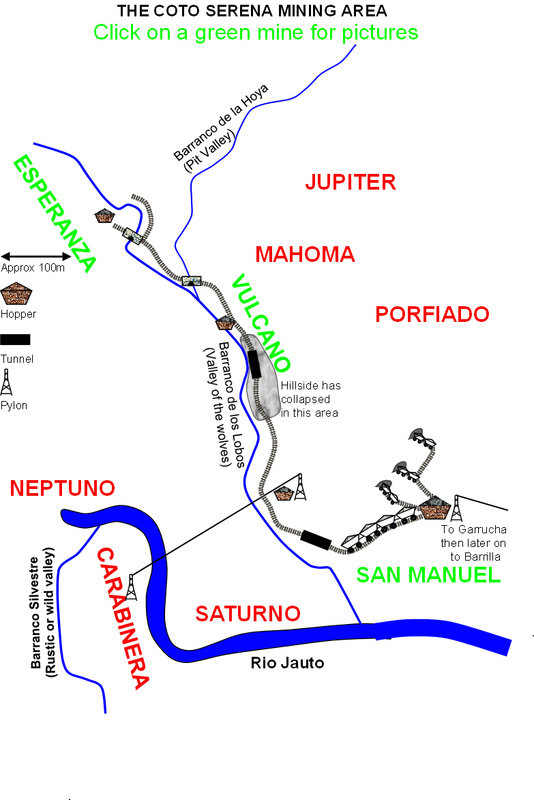 The main mining concessions of the area were Esperanza, Vulcano, Neptune, Mahoma, Jupiter, Porfiado, San Manuel, Saturno and Caribinera. Although these concessions were not all worked at the same time and were often combined by later companies, I have used these concessions as markers in my diagram of Coto Serena. Note that only those concessions shown in green have been explored by me and/or Phil. To see a more detailed look at these mines, click on the appropriate heading. Those in red are deduced from maps and Juan Antonio Soler's web site. Please note that although Coto Serena is only a part of the whole Bedar mining area, it is still large and complicated. Please use the aforementioned web site by Juan for more details. This is perhaps the easiest concession to visit. Leave the Bédar road at the Catalina hopper and climb the steep track to the top, leaving the private road to your left. At the top you now follow the track of the Catalina railway. After a short while you come to the Catalina tunnel. Take care, it is very narrow and dark. About 100m into the tunnel, look up and right and you will see the loading chute for the Alerta mine which is above the tunnel and right. 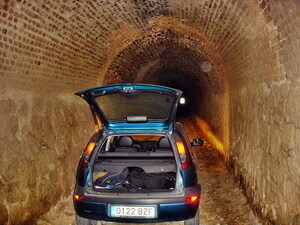 Continue through the tunnel. On the left are the scarce remains of the Catalina open cast mines. Shortly after this, on the right, are the remains of an engine shed. To the right of this is the Higuera mine. Follow the road round to your left and up. Look out for what appears to be a dam (but isn't) to your left. Just past this you will get a magnificent view of Los Lobos valley with San Manuel near the bottom. Follow the track down to see the ruins. The detailed map locates each building. Access is less easy than to San Manuel, but essentially you take the same road as above as far as Higuera, but go right round the mountain. Two clues are to keep what looks like a tall modern electricity tower to your right, and to look out to your left for a railway bridge across a ravine [the Barranco de La Hoya (Pit Valley)]. Here you have found the other end of the railway from San Manuel. Here also are many ruins. The railway continues along the Lobos Valley towards Esperanza. This is easily found from Vulcano as you can see it along the Barranco de los Lobos. A number of narrow gauge lines ran from the hopper at San Manuel. Three went to mine entrances while one went to the “Grand Incline”. This was a huge plane that went towards the Jupiter Pit. To see a picture of this when it was working, look at Juan's site under Cañadicas. The longest line went to the left, passing Vulcano and San Marcial, finishing at Esperanza. It followed the upper part of the Lobos Valley. The line was about 3km long. It is possible to walk part of it, with care. Go down from the hopper, leaving the buildings to your left. 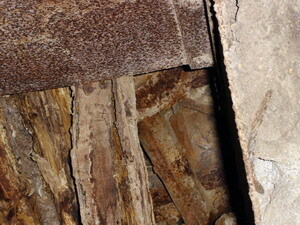 Go through the short tunnel and you will then see the remains of sleepers, some still with the rail fixing bolts in. After a short while you will pass through another short tunnel, after which you will see a hut which I believe to be the end of the aerial cable to Caribinera, across the other side of the Valley. You can then carry on along the line for a few hundred metres. However the track becomes more and more eroded until just short of Vulcano, a massive slip has destroyed the way and most of a tunnel. Back at the main road, turn right towards Los Gallardos. Road widening has swallowed up the main line track. About 300m down the road is a lay by on the left. Park here to see the Boliche tunnel. It is 50m away at the end of a small field. Entry is not possible as the farmer uses it. Skirting the tunnel to the other end, the track way continues down the hill towards Garrucha. 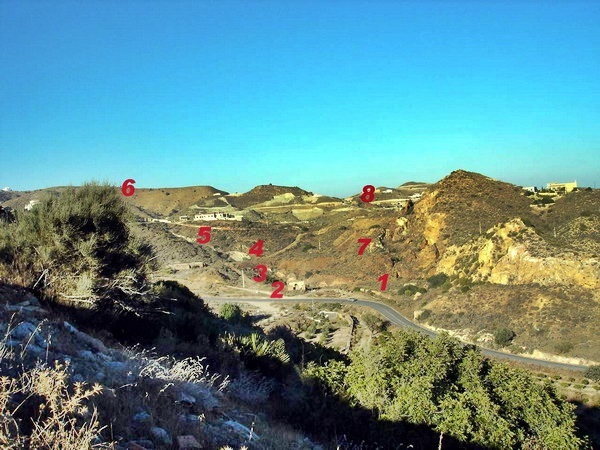 This part of the track is easy to follow and makes a great walk with views right down towards Mojacar and the coast. After passing through an unsightly rubbish dump, the track reaches a cutting where, on the left are the still quite considerable remains of a loading bay. 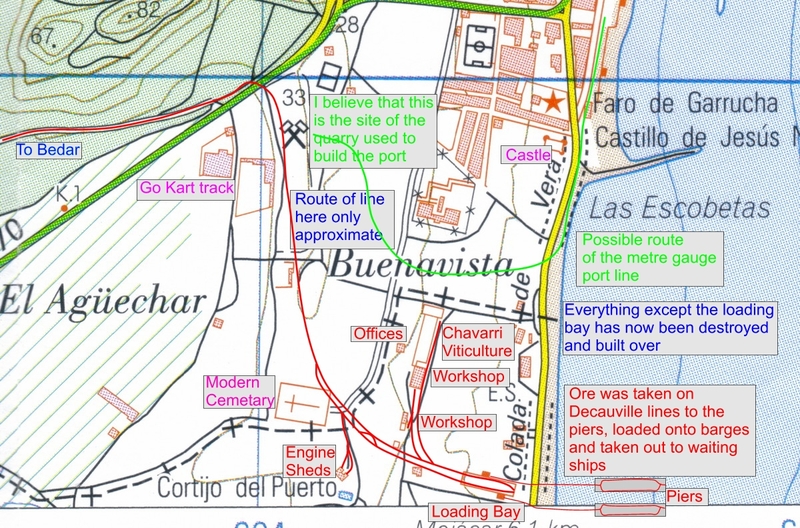 This is the Barilla loading bay and was installed when the Garrucha cable way (shown going off the map to the right on the main map) was closed and everything went by rail. The track now continues gently downwards with very impressive embankments and cuttings. The condition of these is a tribute to the workmanship of the builders. A small amount of scrambling is required on a couple of occasions where a bridge used to be, as only the pillars are left. How far can you walk and how long will it take? There are a number of options. To follow the track down to the main Los Gallardos road, into the town, then back up the Bédar road would be close to a good day's walk at a gentle pace, so you could start mid morning, walk down to the road, then go into Los Gallardos for lunch, walking back in the afternoon. If that is too much, all along the track way are lanes leading towards the Bédar road. I did this option, coming out by a school, then back up the road. This took me around two and a half hours. The Murcia - Almería motorway sliced through an embankment of the railway. This is where you will arrive if you do the full walk above. To get to Los Gallardos, go down the embankment to the small road, turn right and in a short distance turn left under the motorway. Turn right again and you are on the road to Los Gallardos a short distance away. I have yet to walk the next bit the other side of the motorway but have been told that it is not easy as farmers have ploughed sections away and planted crops. I have, however, walked about 3km from the Garrucha end. 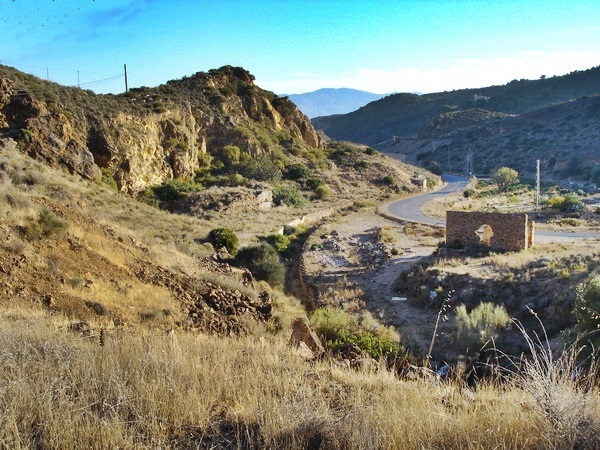 To find the track way, take the coast road from Mojacar to Garrucha and turn left just inside the village. Go up the hill, past the football ground and at the top turn left towards Los Gallardos. The track (now a small road) is immediately off to your right, The road used to say no access but no longer does. It is in a poor state but you can safely drive for a km or so to a small cutting where there is parking space. Although the track continues I do not recommend further driving as it is now unsurfaced and very narrow. There is now easy walking for about 3km, past a delightful view of the sewage works! After this there is about 3km more to the motorway crossing mentioned earlier. This is all very sad. Ten years ago all the buildings, sheds, administration etc were all still there, albeit in poor condition. All have now gone, swallowed up by development. The only building left is the loading bay, which so far seems to have been protected although each year I expect to see it gone. The bay is easy to find, it is on the right a short distance along the coast road from Garrucha towards Mojacar. Trains coming from Bédar ran along the top of the loading bay, where they deposited the ore. It was taken across the road (then just a small track) and along a pier out to sea. From here it was taken by barge to waiting ships. Unlike the pier for the Agua Amarga - Lucainena line, the sea was not deep enough for the ships to moor at the pier. Below is a sketch showing the original location of the buildings. The Bedar-Garrucha line is shown in red and the temporary port construction line in green.